Guitarist Bibi McGill has probably had enough of Kanye West and his rants! The lead guitarist to mega superstar Beyonce took her Facebook to let the world know what she really thought of Mr. Yeezy! It’s been five days since the 57th Grammy’s and rapper Kanye West is still ruffling feathers! After Beck won the title of “Album of the Year,” West pretended to steal the show like he did to poor Taylor Swift years ago! Then to add insult to injury, he did another one of his infamous rants about how Beck should respect artistry! 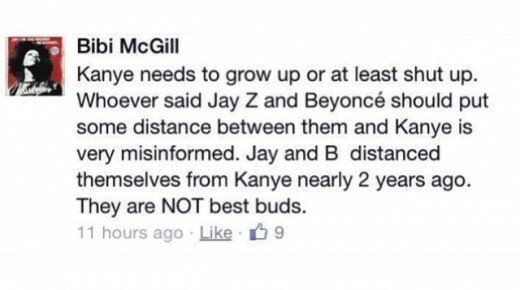 Well, it seems that Beyonce’s lead guitarist Bibi McGill is fed up with Mr. Kan-Yeezy! The talented musician took to her Facebook to let the world know how she really feels about him! It seems she’s spilling all the tea about that little friendship! What makes it even for more interesting is the Carter’s have began distancing themselves away from West right around the time he wifed up reality star Kim Kardashian. Makes you wonder if it is just the rants that they don’t agree with? Although the post has been deleted, I cannot blame her for her frustration! As talented as Kanye West is…he can be a bit much! What are your thoughts about McGill’s post? Comment below! Kim Kardashian Responds To Accusations Of Fogetting North At Hotel! OMG: Kimye On The Verge Of A Divorce!!! Kim Kardashian Upset Because She Can’t Get Pregnant! Chile…folks gon learn about puttin all their thoughts on social media honey. Let these folk speak for themselves.